My name is Louise, but most of my friends and family call me Lu, Lulu or Lula. Take your pick! I alternate between cameras depending on my mood and how much I feel like lugging around a heavy bag! Film photographs are taken with a Canon EOS 650 (a 35mm film camera) and 50mm 1.8 lens. Up to December 2016, I also used a digital Nikon SLR (D5100) and an iPhone. Then, after 10 years of photography as a hobby, I upgraded to a full-frame Canon 6D and 40mm 2.8 lens. I’m in love! My mantra is natural light, natural light, natural light and I edit in Lightroom, mainly with VSCO presets. Why is your blog called Beside The Danube? I began this blog in 2011, just as the leaves were beginning to turn amber. 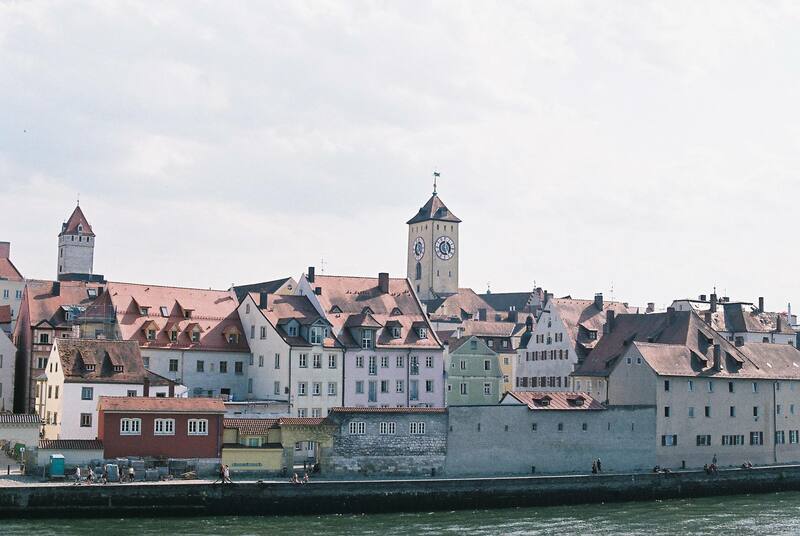 I had moved to Regensburg, Germany (pictured above) to complete a mandatory year abroad that summer and was teaching English to teenagers while living beside the blue Danube. That year I spent many a contented hour swimming in the river, strolling its banks, lounging beside it in the sun and cycling along the Danube bike path. It seemed fitting as a blog name and though I am no longer physically beside the Danube, the name remains because I’ll always have a (inexplicable, irrevocable) soft spot for the place. Home, as of March 2018, is a rented house in a town on the fringes of Oxford. It’s a short bus ride into town, and hemmed by meadows and fields. I’ve moved around a fair bit since starting this blog; in the archives you’ll find dispatches from Bavaria, rural Austria, Bristol and various pockets of London respectively. I work from home mostly! I am a freelance translator, writer and editor. I spent five years working in London publishing houses before leaving the city and making a go of doing it my way, something I’d dreamed of since finding myself in a stuffy office at 22 (without really meaning to be there). I’m visiting London. What should I do/see/eat? My very favourite places in the city are those that make me feel I am in the country – grassy hilltops, the oscillating fields of the Royal Parks, the riverside, the Grand Union canal, anywhere green, but I appreciate that might not be everybody’s quintessential ‘London’ experience. Right now, a perfect London day would include one (or all) of the following: a languid walk through Regent’s Park via the rose garden and St John’s Lodge, a trip to Daunt Books, a wander around Borough Market, dinner and Hugos at Kipferl in Islington, the sunset from Primrose Hill and a play at the National. At Christmas, ice-skating at the Natural History Museum or Somerset House is a must. Feel free to email me for a more thorough and personalised list of must-sees and dos! I’m visiting Oxford! What should I do? I’m a newcomer to this city (as of summer 2018), which is really rather a small market town parading as a city. It’s entirely walkable, should you be able and so inclined, and a gorgeous place to wander the backstreets (and dodge the many and multiplying, camera-wielding tourists!) I’ll write some posts as soon as I am a little more familiar with the place, but so far favourite weekend activities include: coffee upstairs at Turl Street Kitchen, cake at Barefoot in Jericho, wandering the Covered Market, browsing at Blackwell’s and a wander through the Ashmolean. The Botanic Gardens are also worth a visit for plant-lovers like me! Yes, as long as you link back to my site and credit me. If you do, I’d love to see it: please do send me a link! Certainly! I love working with like-minded creatives. Please get in touch via [email protected] I’m also available to discuss freelance writing, translating or editing opportunities. Just get in touch!